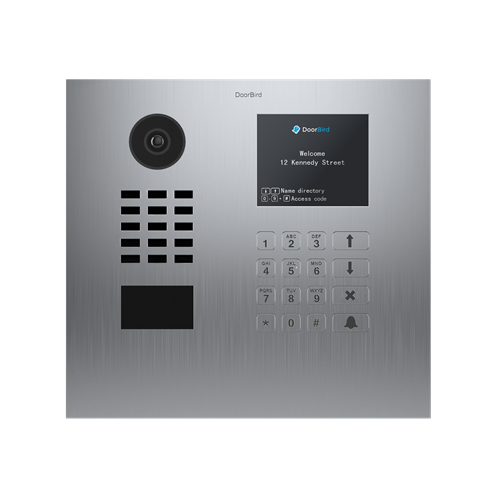 The DoorBird D21DKH is a multi tenant IP Video Intercom system designed for use in apartment buildings and multi dwelling units. Installed at a front entrance or gate, visitors will be able to use the name directory to find and call residents. Residents will use the free DoorBird iOs or Android apps so they can see who's at the entrance, listen-in and have a two way voice conversation. When connected to an electric strike or gate operator, the gate or door can be opened remotely by the resident. DoorBird features high quality 720p video and full duplex two way audio. The system provides full colour video during the day. At night, it will automatically switch to night mode that allows it to see in pitch black with its built in infrared LEDs. The built-in RFID reader can be used with DoorBird cards or tokens to allow residents to automatically open a door or gate when they present their credentials. The D21DKH can also be used with SIP systems, has an open API and can integrate with Control4, Crestron, RTI, URC and many more.